Village President Paul Lohmann has given hope to a women who was about at her wit’s end. Lohmann, who has already proven himself an advocate of Beecher’s proud past as well as its promising future, is now taking on a new project. 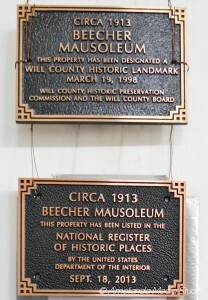 He has offered to help Sandra Thielman with the Beecher Mausoleum project. Sandra’s great-grandfather Henry Thielman is credited with building the historic Beecher Mausoleum, a significant undertaking in its day that stands today as a landmark structure, thanks largely to her efforts. She is likely cut from a similar cloth as Henry Thielman, who was a real estate developer and considered one of the prominent early citizens of Beecher. Thielman was the vice-president of the German-American Land Company that had offices in Chicago and Arkansas. He came to live in Beecher in 1899. Sandra has built her own successful steel company AMS Resources Inc. in Crystal Lake. At about the same time Sandra took on the restoration of the mausoleum through her reverence of the past, the beauty of the building, and the familial bond she shares with her ancestors. 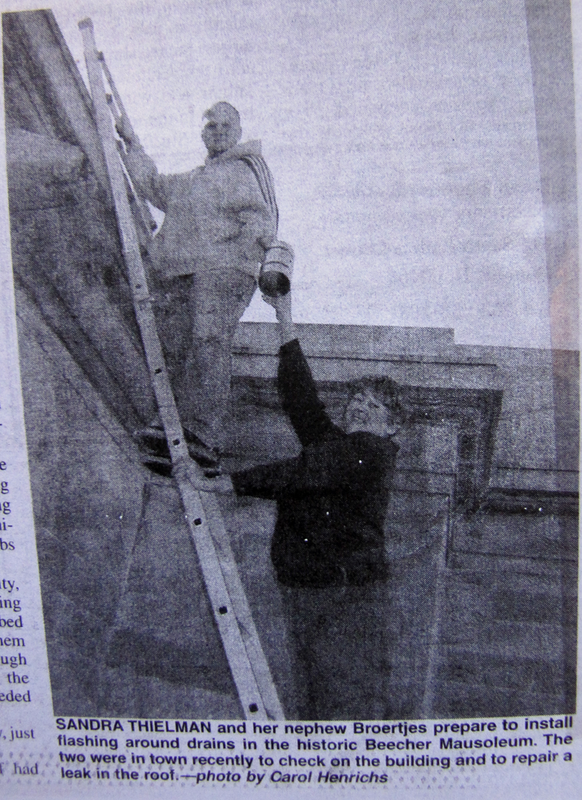 Sandra took on the maintenance with an eye toward complete restoration of the mausoleum about six years ago as a result of a promise to her 97-year old grandmother, Paula. It was Paula’s desire to be buried in the Beecher Mausoleum, next to her husband Walter, Henry’s son, and their son Loren, who died in a plane crash. Sandra’s mother Dolly is also buried there, as is Henry’s wife Minnie. It was Paula’s wish that first brought Sandra to Beecher. She visited the mausoleum about severak years ago for the first time. She was appalled at what she saw. The neglected building had been vandalized and in a total state of disrepair. It was so different from the place she considered sacred when she was a child. Her family brought her there many times to pay their respects to deceased family members. Sandra, who lives in Wonder Lake, not far from the Wisconsin border, has traveled often on weekends to work on the mausoleum. It was not uncommon to see her atop the building, patching the roof and windows, cleaning the exterior with caustic chemicals, or repairing old marble slabs inside. She took on the responsibility, largely by herself, of researching the ancestors of those entombed inside. She asked many of the for help. She raised enough money to at least secure the building and do some needed repairs. Sandra came back recently, just to check on the mausoleum. She found that the roof had been leaking a little. It caused some damage. She realized that she could no longer drive two hours each way just to check for leaks. So she returned the following weekend, with her nephew Justin Broerjtes. The two of them repaired the leak in the roof. But, she realized that without help, she couldn’t continue. There is so much more that needs to be done. The place has so many possibilities. A similar mausoleum exists in west suburban Elmhurst. It has been completely restored and is being used for burials and stores urns containing ashes. Sandra believes Beecher’s mausoleum could become viable again with a little help; it is not full. There is still plenty of room inside. “It could even earn its keep” she said. Sandra envisions a chapel inside, as the final gathering place for family members, as it once was. She was so excited when Lohmann offered to help. Lohmann played a huge role in the Depot Restoration Project. Lohmann had plenty to do with the completion of that project. What he didn’t do himself, he got others to accomplish. And, he is becoming a wizard at getting folks to participate, donate, and generally help when needed. Lohmann thought he would call together a summit meeting of sorts, bringing in township officials and various churches. He said there should be something they can do to pitch in to take care of the building where many of Beecher’s early citizens are laid to rest. He asked the village board members at a recent meeting if they had any objections to his trying to get something to happen for the mausoleum.